When you want to know if you are pregnant without a doubt, you want an accurate test. Perhaps you are still preparing to start on your parenthood journey and just want to get a handle on your cycle and when you are ovulating. In this case a good test will help you decide on timing, but also save you money on using tests that don’t accurately tell you where you are. In this review we will tell you a little more about Clinical Guard’s Ovulation and Pregnancy test strip combo. We will tell you what these tests offer in terms of their features. We will also tell you about the good aspects of these tests. We will also be fair, and hopefully as clear as you want a test to be, we will tell you what is not good about these tests. We will give you a verdict so you can decide if these products will be helpful to you when you need to be sure about what your body is doing and telling you. This is a life changing event and you want to be sure if you are pregnant or not. Let’s take a look below so you can get a clear overview of what Clinical Guard offers with its tests and if you will be happy with this offer. These tests can be used at home and reacts within five minutes. You get 20 pregnancy test strips and 50 ovulation test strips, which work in the same way as any of these typical tests. The ovulation test measures Luteinizing Hormone in urine, whereas the pregnancy test measures HCG in urine. First, let’s start with the packaging. When you buy a large amount of tests at the same time it will need a larger container than single use tests. The box is well designed with good visuals, but you will not be able to discreetly hide it anywhere. So if you don’t care that the rest of the people in your house know you are in the midst of discovering when a baby might be on the way, it will be fine. On the other hand, if you want some privacy surrounding the matter, you will need a large bathroom cupboard. But that is all just cosmetic. Let’s get down to how these tests perform. These pregnancy and ovulation tests by Clinical Guard vary a little in their effectivity. 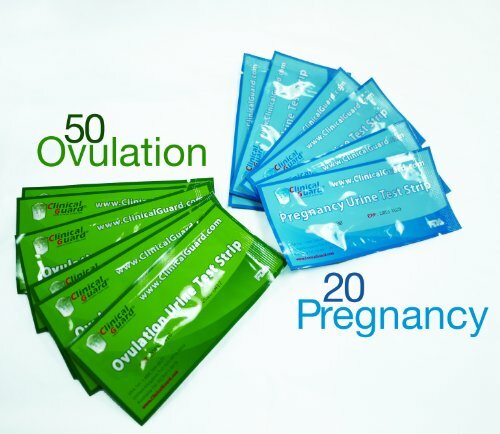 If we start with the pregnancy test, it is a reliable and easy to use strip. It does not have any evaporation lines and the results are easy to see in both positive and negative cases. It is accurate and easy to use. The ovulation test does not measure up as great as the pregnancy test itself. The lines are not as clear or distinct as with the pregnancy test. When you compare these to other brands the lines are also very light and can leave you unsure of the results. Although this does not seem to happen in all cases, it can be frustrating wasting a month on these. With both these tests, the results will be clear and accurate if you follow the instructions and wait the full five minutes for the reaction. As with any set of tests there can be a few in the batch that aren’t exactly as clear, show evaporation lines or give false negatives (in the case of ovulation tests at least).You can do a couple of tests before you dismiss the single result. This is a type of home science after all and as a good scientist you can question results. All things considered, the Clinical Guard’s Ovulation and Pregnancy test strip combo offer great value for money. Both of these tests are easy to use by yourself. The fact that they come as a combo is helpful when you are trying to conceive and need to track your ovulation and keep tabs on whether you are pregnant or not. When you use the home pregnancy test, just remember that the test line must be dark, or darker than the control line. Even if it is not as dark as you expected, it can still be darker than the control line. When it comes to the ovulation test, keep in mind that there is always some LH in your system. There is a surge when you ovulate and that is when the test will give a clear positive. So if you don’t want to spend huge amounts of money while you are trying to conceive, and you don’t want to run to the store thousands of times. This combo pack by Clinical Guard is a good deal. It is easy to use, accurate to a high level, and convenient. Hopefully these tests will help you know exactly where you are in your journey towards conceiving. Devon Medical Wondfo Ovulation and Pregnancy Test Strips: Getting What You Pay For?